“Maid Kissa” (Maid Coffee Shop) In this cafe, a waitress who wears a black or navy blue colored frilled white apron dress with a hair band so-called the housemaid clothes meets you “Welcome home” as you drop by. A visitor takes a photo with her, and some events and goods sales are also available. Each shops are quite characteristics where otaku from animation, manga, and games meet together and create one cultures. 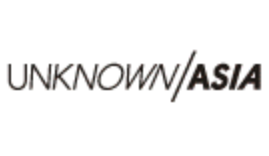 Akihabara in Tokyo has a biggest communities. A number of this kind of coffee shop is small here in Sapporo, however, this is the one of the cities that leads a trend for Maid Kissa. 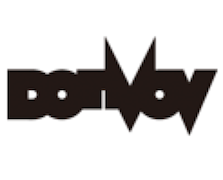 “harmonica bldg.” is a Sapporo based man and woman unit, an art director Naoki Fujita and a designer Kaori Kojima. Have received prizes both nationally and internationally. Selected to the SHIFT2007 calendar, and also featured their cover design and interview in February issue by Shift are quite fresh in the memory. 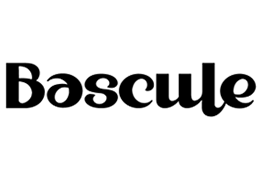 I also like and see often their works such as apparel company’s promoting items, art-directed books, and other originals. I would say that they make things modestly with a specific clear concept while carrying peculiarity or they’ve got steadiness and neatness with slight avant-garde taste. 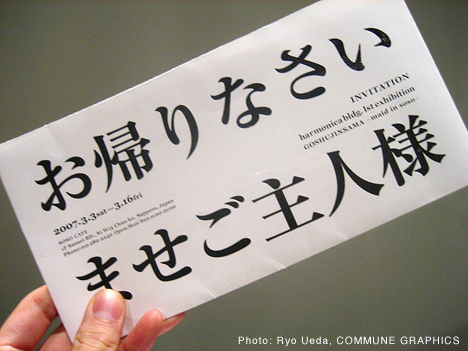 An exhibition of harmonica bldg. was held at SOSO CAFE. I joined their opening party. 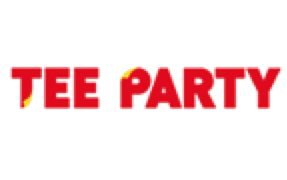 Very excited by hearing that they were having a secret event at the party. It was easy to imagine a packed inside as I arrived there 10 min. late and saw an atmosphere of the entrance. 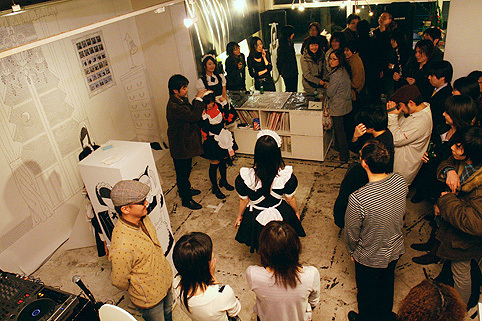 A place has changed to Maid Kissa space where some costumed maids working. They are all experienced maids, I heard. The cafe resounded with Anime soundtrack from DJ booth. 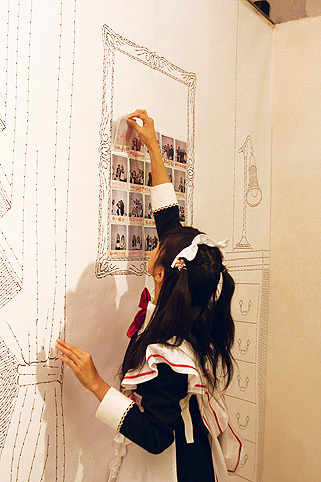 A largest wall in the hall is set for “shooting spot” where visitors take photos with a maid. Polaroid pictures posted on the wall becomes an art work. And furthermore maids draw a picture with ketchup on an omelet, serve pudding to visitors, decorate a cake etc. A plenty of Maid Kissa services during the party. Both members of harmonica bldg., become a butler and a maid, enter into the spirit of the festivities. Around two groups were there that night. 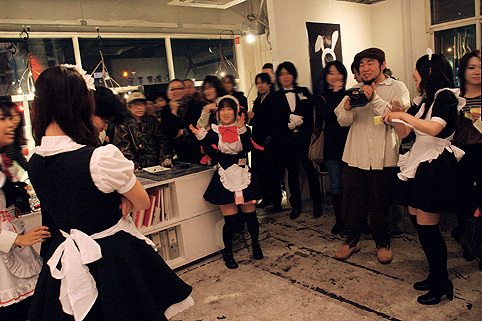 One is the patrons of Maid Kissa, and the other is in graphic design. They would never have met one another unless this event was held… harmonica bldg. as a bridge. A maid’s presence. It is a party with a mysterious atmosphere that nobody knows. This harmonica bldg.’s work reminds me “Alice in Wonderland”. A main character of this picture book also wears something like apron-dress. 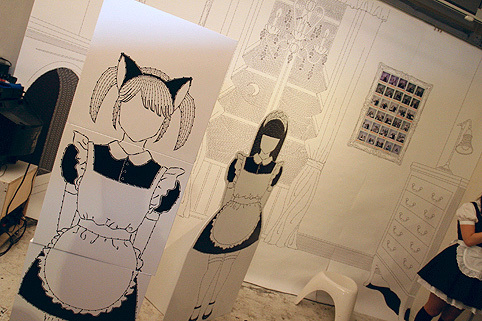 Classical “Alice in Wonderland” and “Maid Kissa” of Japanese modern culture. A graphic design binds these two in this exhibit as well as the opening party. “Wonderland” from Sapporo presented by SOSO CAFE… having a joyful moment thinking in this way, I cannot help grinning with feeling like having been had by harmonica bldg..